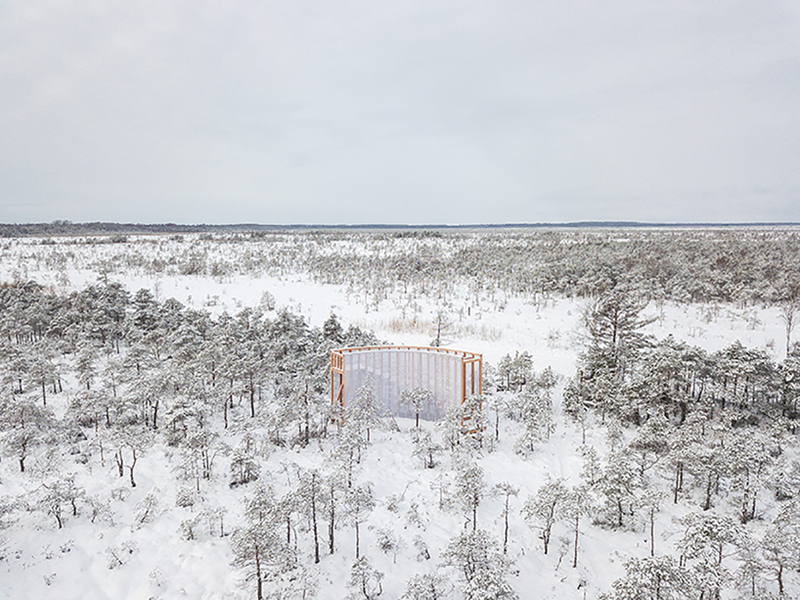 architecture in estonia surveys the contemporary condition of the country’s built environment, showcasing a range of innovative projects and the diverse materials and unconventional forms employed in their construction. 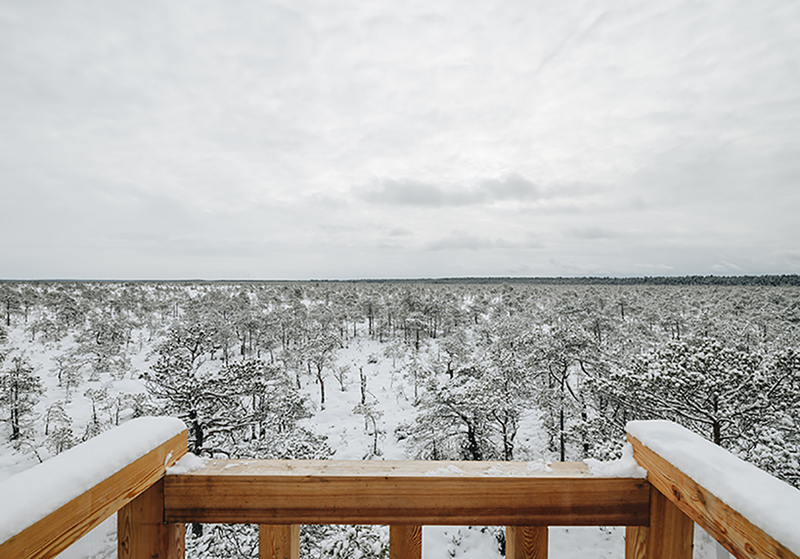 at the center of old tuhu bog – one of the biggest mires west of estonia – an infrastructure of fresh wood awaits the ascension of patient surveyors and the perching of rare birds. 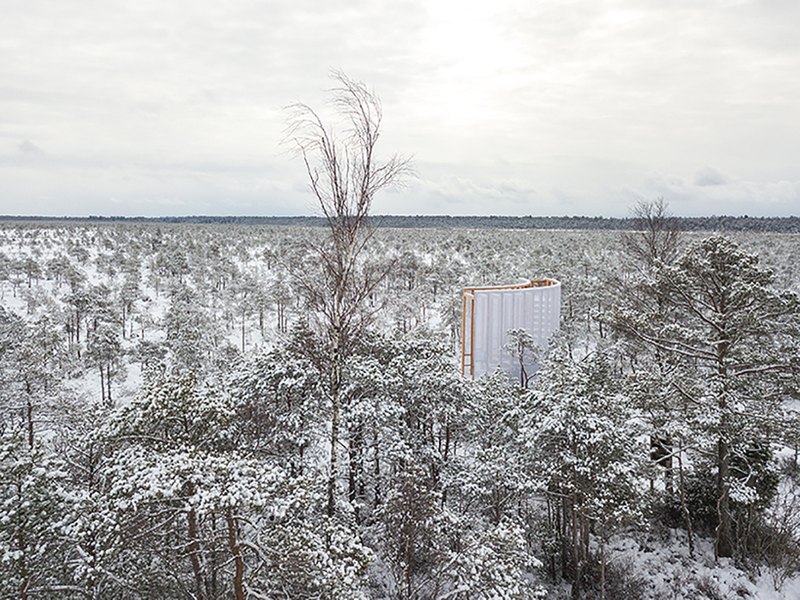 as a part of their curriculum, second year students of the estonian academy of arts’ interior architecture department designed this observation tower for the many birdwatchers who visit the bog from early spring to late fall. 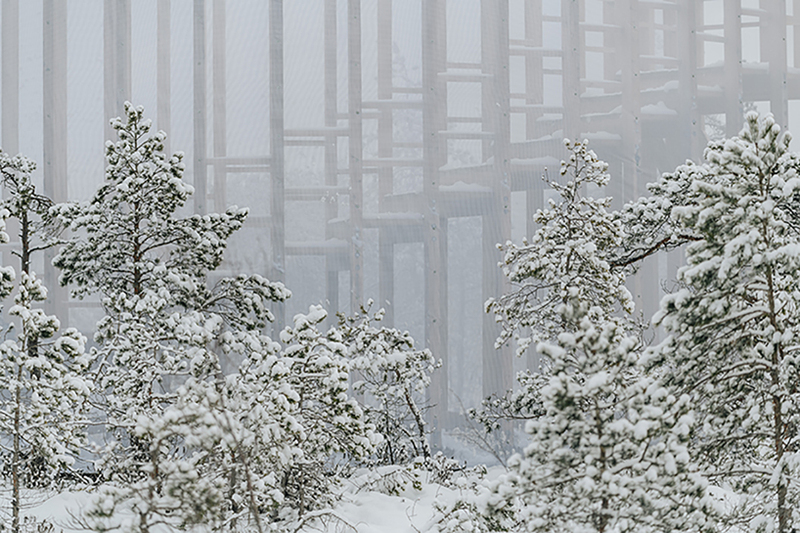 the tower, called TREPP (‘staircase’ in english), compliments a 2 km boardwalk through the boglands. 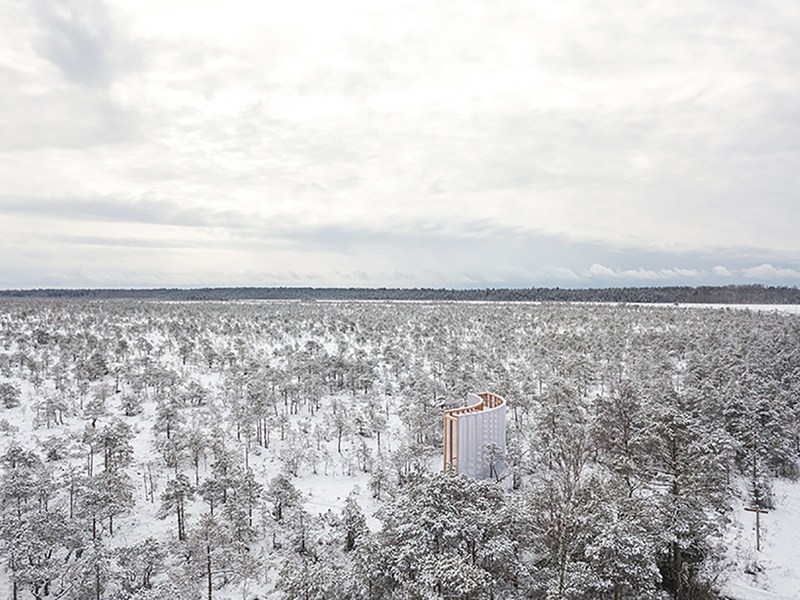 currently, the obersavtion tower hibernates under layers of the estonian winter snow, but it will be ready for hikers and watchers in the early spring — the start of the busy birdwatching season of 2018.
despite easy accessibility, the sombre mire is still quiet — relatively unharmed by human activity. taking an environment such as this into consideration, while adding a contemporary design to an untouched ecosystem, was a delicate thing to do. 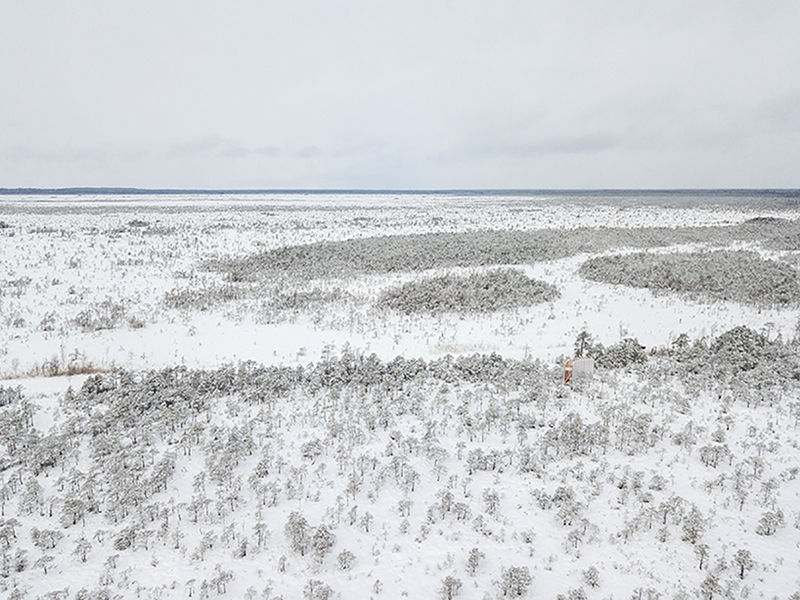 students and facilitators considered the hikers, the ornithologists, the floods that come several times per year, the -25c to +25c temperatures, the ecosystem, its beauty, and its many protected species. 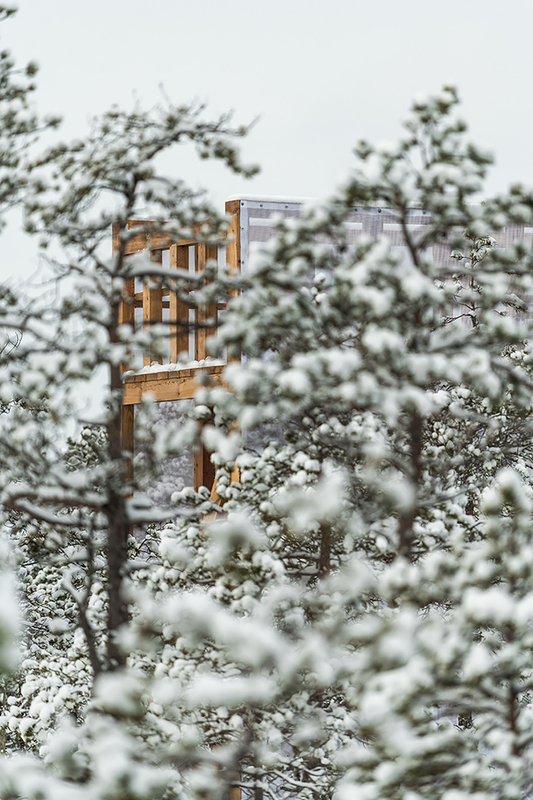 then, they set out to design and build a lone structure, a contemporary one, at the center of it all. 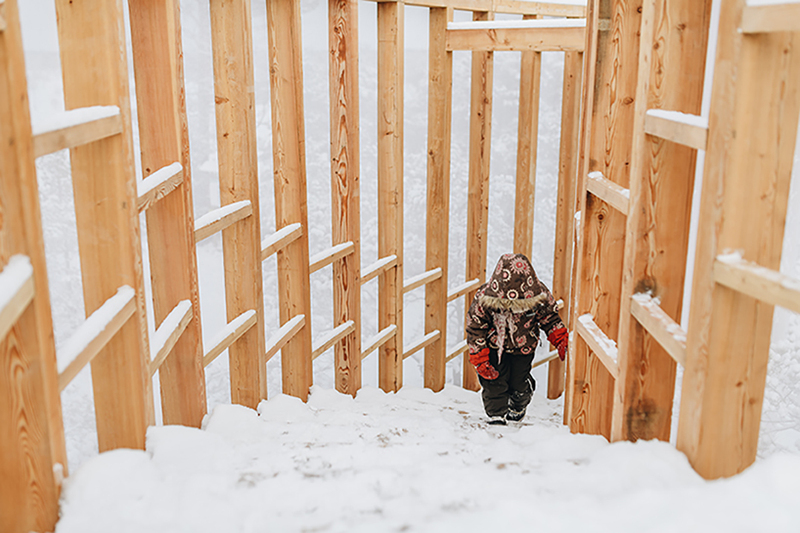 TREPP is a quarter-rounded wooden building, comprised of an open corridor, a spiral staircase, and an observation deck. 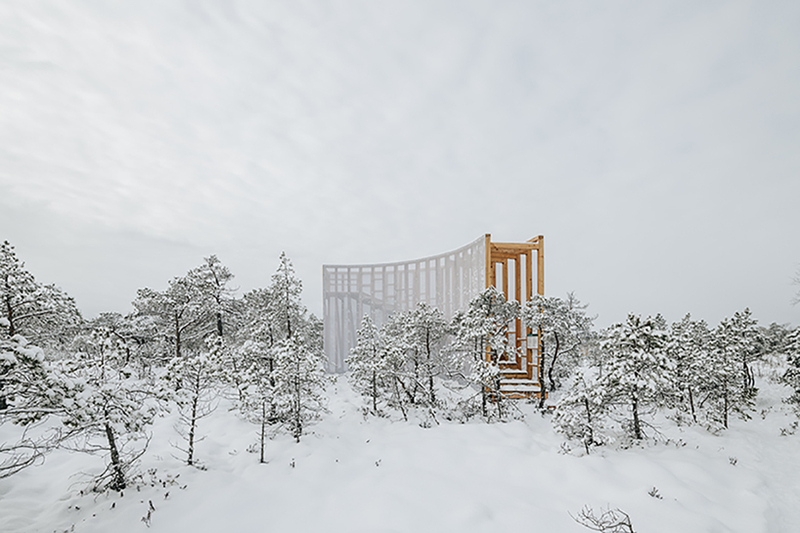 that netting, covering the structure, is a semi-transparent fabric, which limits the visitor’s view as they move up the stairs — amplifying the anticipation of the final, unobscured vastness they journeyed to find at the top. according to the students, TREPP is an invitation of value. those who humbly accept this invitation may find themselves trudging 2 silent kilometers, hearing and seeing their breath, until they find a place to rest just for them. the journey could end there, or it could begin. 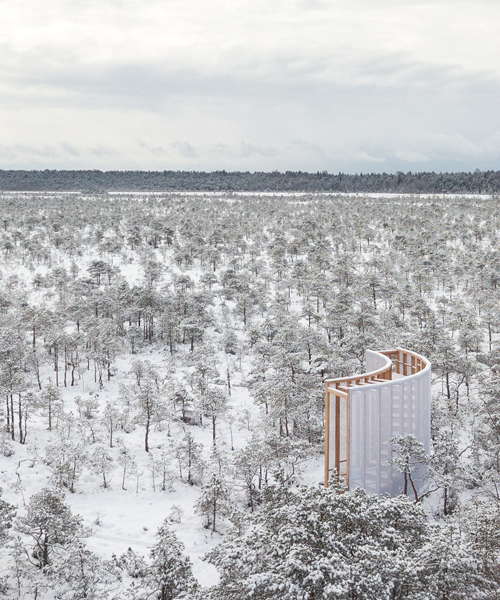 the students at estonian academy of arts have considered just about everything with this staircase tower. now, it’s time for nature — the birds and the floods — to consider it. tuhu landscape reserve, kiska village, hanila municipality, lääne county. tower surface 16m²; height 5m; length of the twisty staircase 8m; expected service life, 10 years.